DD Form dd1616 or the "Department Of Defense (dod) Transportation Agreement Transfer Of Professional School Personnel Outside Conus (oconus)" is a Department of Defense-issued form used by and within the United States Army. The form - often mistakenly referred to as the DA form dd1616 - was last revised on November 1, 1999. Download an up-to-date fillable PDF version of the DD dd1616 down below or find it on the Department of Defense documentation website. outside the U.S. unless a medical reason precludes the use of aircraft. further PCS transfers within DoD, at Government expense, for a period of one school year from the date of this transfer. This policy does not preclude my acceptance of another position for which PCS expenses may not be allowed. they return to the PDS outside the U.S.
outside the U.S. or reassignment to a new PDS outside the U.S. 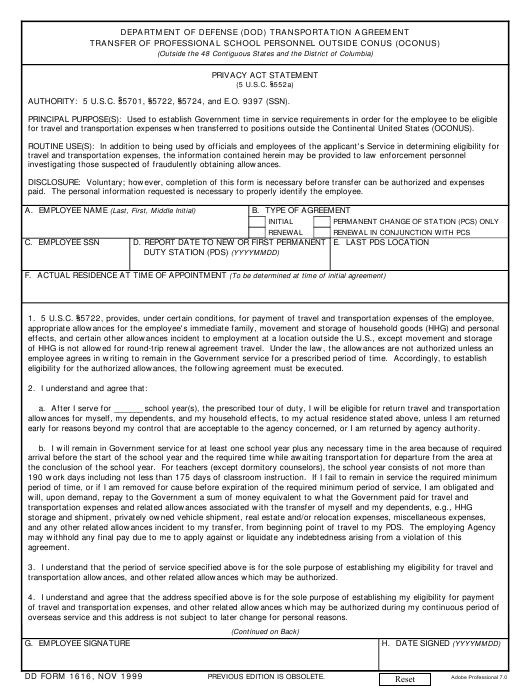 NOTE: Employee should retain a copy of signed transportation agreement for their personal files.